The webinar takes place from 1:30 to 3:00 p.m. EST. "Live-streaming has become one of the biggest stories in digital this year, and it keeps on growing," says Cynopsis Executive Editor Lynn Leahey. 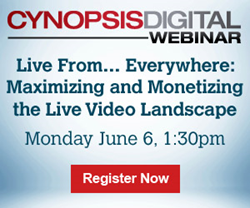 On Monday, June 6 Cynopsis Digital will host the interactive webinar “Live From… Everywhere: Maximizing and Monetizing the Live Video Landscape,” which will review how to maximize and monetize live streaming platforms. The expert panel leading the conversation will consist of Neha Masson, Leads Product Marketing Manager of Video for Twitter; Noah Fenn, Head of Video Sales & Strategy at AOL; Erik Schwartz, VP of media at BitTorrent; and Ronald Pruett, CEO of Roker Media. "Live-streaming has become one of the biggest stories in digital this year, and it keeps on growing," says Cynopsis Executive Editor Lynn Leahey. "Between the sophistication of the technology, the new ways that publishers, programmers and marketers are taking advantage of the format, and the ways that social media giants like Twitter and Facebook are starting to push it front-and-center, it's never been more important to get a handle on how to leverage live platforms. All webinar attendees will receive full access to speaker presentations for 1 year. Webinar tuition is based on location, not number of participants, so each registration site can have multiple participants for one low price. Questions? Contact Trish Pihonak at trish(at)cynopsis(dot)com.